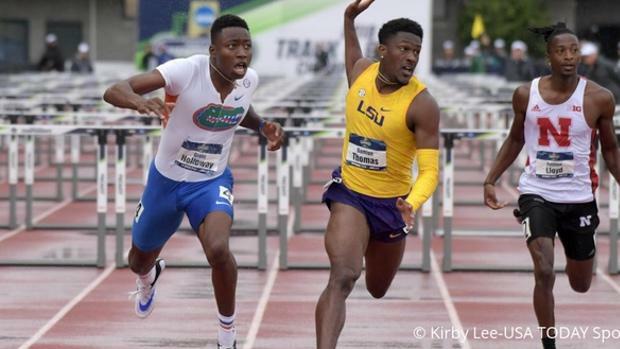 Louisiana State University freshman Damion Thomas tied the world junior record of 12.99 (+0.3) for the 110m hurdles at this weekend's Jamaican Junior Championships. The junior height for hurdles is 39 inches, compared to the senior height of 42 inches. The only other U20 athlete to run 12.99 on the low hurdles was Wilhem Belocian of France in 2014. The 18-year-old Thomas, who went to Northeast High School in Florida, edged out Orlando Bennett for the win. Bennett ran 13.00, which stands as No. 3 all-time. "All year I've been doing college hurdles at 42 inches so to come back down to 39 inches was way easier for me," Thomas told Noel Francis of the IAAF. "The record is something I had my eyes on since I started hurdling. I remember sitting at home watching the French guy break the record and for me to equal it before the World Juniors is a happy moment for me. "Execution is important. At the last World (U20) Championships I was one of the favorites going in, but I hit a hurdle and fell in the semi-finals. This year I'm going there as the favourite again; I just have to execute well and if I do that I know I'll come out with the victory." In his first season at LSU, Thomas captured All-American honors by placing third in the NCAA 110mH final and eighth in the 60mH final indoors. He placed third in both events at the SEC Championships. His best mark over the higher hurdles is 13.44 (-0.8).